I had the opportunity to spend some time with Sel Raab when he spoke at the Mob Museum earlier this month. A retired reporter, Raab’s career was highlighted by 25 years at the New York Times, where he became one of the country’s foremost authorities on the New York Mafia. His most well known book is Five Families: The Rise, Decline, and Resurgence of America’s Most Powerful Mafia Empires, which is required reading for anyone interested in mob history. 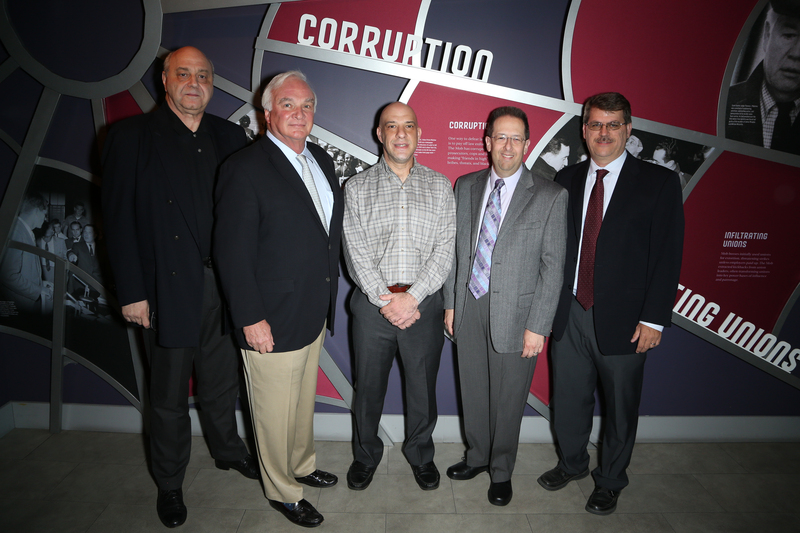 Dan Moldea, Stan Hunterton, Scott Burnstein, Michael Green and Geoff Schumacher before a June 2015 panel discussion on Jimmy Hoffa at the Mob Museum. 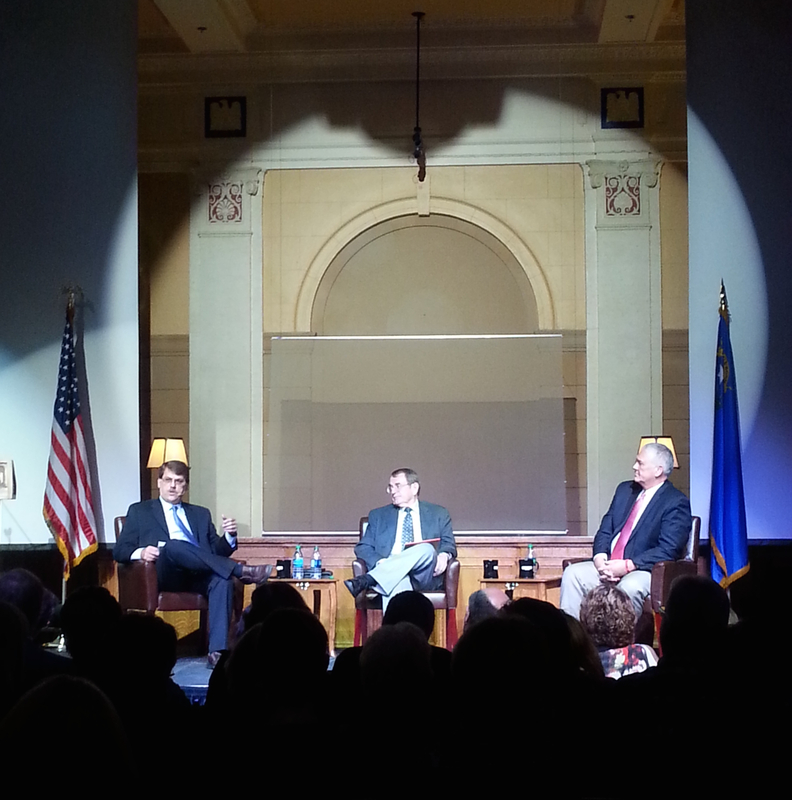 Geoff Schumacher, Larry Gragg and Warren Hull in the courtroom of the Mob Museum, March 24, 2015. The designer, Sue Campbell, and I plan to send the book to the printer by mid-December. We are in the final stages now. I received the first draft of the layout today, and now the work begins to refine the look, proof the text and finalize the photo selections. The book will be released in late May. It’s being published by Stephens Press but it will be marketed and distributed by the University of Nevada Press. “Nevada: 150 Years in the Silver State” is going to be a fine book. It will be thick — probably 288 pages in a small coffee table size. More than 70 writers and about a dozen photographers have contributed to the book. Many well-known Nevada writers are represented. We cover a lot of ground in the book but it is not a comprehensive history of the state. There is ample history but writing about contemporary Nevada is laced throughout the book as well. It should appeal to a wide audience. Although it can be read from front to back, it also can be enjoyed more selectively. I’m excited about it, but I’ll be very happy when the work is done. 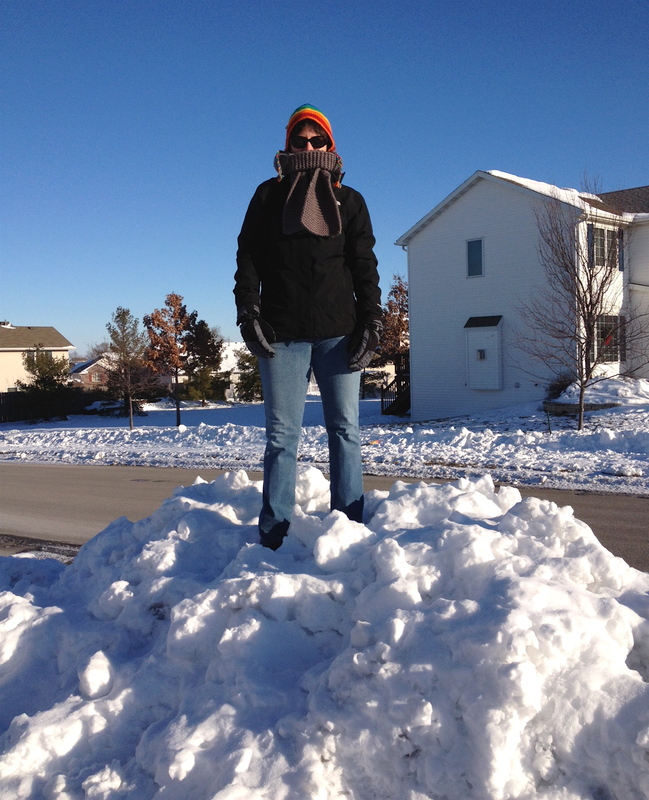 Tammy stands atop a huge pile of snow in our neighborhood after a December 2012 blizzard. It’s been almost exactly a year since my last Midwest Adventures post. This gap can be attributed, I think, to 1) being busy with everyday life and 2) becoming more settled in this part of the country and feeling less like a newcomer here. Still, I could have written several pieces over the past twelve months under the Midwest Adventures banner, I just didn’t get it done. We have reached what we hope is the tail end of our second winter in central Iowa. The first one was very mild. It set records for warmth and lack of snow, and as a result it was a nice way to ease us into the Midwest. This second winter has been closer to “normal.” There’s been quite a bit more snow, and it’s been colder overall. And yet, long-term locals insist it’s still been relatively mild compared with some of the winters they’ve seen. We aren’t eager to experience a winter season much more severe than this one. The tone was set with a genuine blizzard in mid-December. We got 10 inches in less than 24 hours. 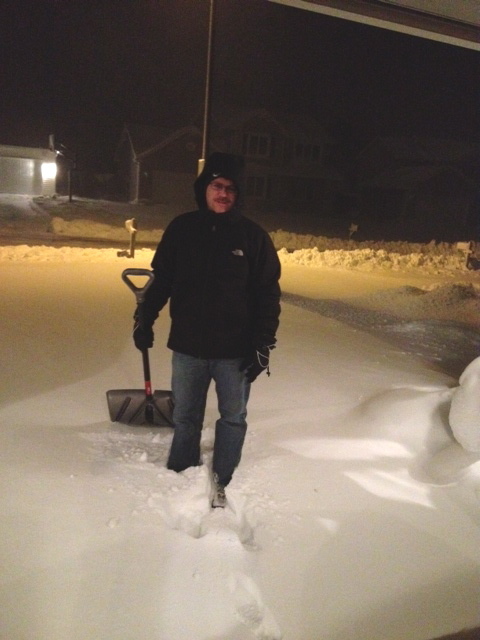 I still don’t have a snow blower, so shoveling out of that storm was a three-day affair. Ultimately, our neighbor did bring over his snow blower to help us with one particularly big pile lingering in the driveway. By anyone’s standards, it was a big snowstorm, and there are vestiges of that snow still on the ground around Ames. Snowstorms affect driving, and they affect walking. Driving issues are alleviated pretty quickly in the city by sending out dozens of snowplows to clear the roads. People drive slow, not only because it’s the smart thing to do but because there are stoplights and lots of other cars on the road. But the highways are a different story. They take longer to become safe. When people can’t go to work or school — just can’t make it — it’s because they have to take a highway to get there. Cars slide off the highway a lot, ending up “in the ditch.” This is a phrase you don’t hear much out West, but it’s very common here. Being “in the ditch” usually doesn’t mean you are dead or injured, and often your car suffers little or no damage. But it’s scary and certainly has the potential to be serious. Knock on wood, we haven’t been in the ditch yet. Shoveling in the dark is not the most fun a person can have. We’ve had several more periods of significant snowfall since the blizzard. Each time the first order of business is to clear the driveway and sidewalks. I don’t mind shoveling actually, if it’s not too cold or windy. I like the physical exertion and the sense of progress and completion of the task. I like the fact that I’m getting better at it and faster. If there’s a significant snowfall, there is likely to be either a snow day at school or a two-hour delay, allowing time to clear the roads before the kids venture to school. Sara has been off school a fair amount this winter, and being a senior, she doesn’t have to make up the time at the end of the school year. The younger kids will have extra days in May, which I’m sure they will gripe about when they arrive. Sometimes, after a storm, the paper doesn’t get delivered in a timely fashion. Walking is another matter. Walking is an issue long after the snowstorm has passed, because commercial sidewalks and parking lots remain icy. You have to be really careful. People are falling a lot, and some of them end up at the doctor or chiropractor as a result. Some people get very anxious about walking in winter, while others don’t. Knocking on wood again, we haven’t had any painful falls yet. We’re expecting another spot of snow starting tonight and running through tomorrow. It’s not expected to be much, but you never know. The meteorologists do the best they can, but weather can be unpredictable. That certainly was the case with our most recent large storm. The meteorologists said it would miss us entirely — that it would go east instead of north — but overnight that changed, and nobody expected the six inches that we got. It’s possible that this will be the last snowstorm of the season. Locals say we tend to get our last snowstorm during the state girls basketball tournament, which is going on now. Assuming they’re right, this could be the last one, and we will start turning our attention to spring. On the other hand, my neighbor, a lifelong Iowan, tells stories of times when he’s seen big snowstorms in April. Although we have stoically endured this winter, we are eager for it to be over and to enjoy the warmth and new life of spring and summer. Spring here is kind of like a prize for making it through the winter. The birds and other wildlife emerge, seemingly out of thin air, and the farmers and gardeners jump into action. People holed up for months are suddenly on the go all the time. Still, a nagging question in our minds during these long months of December, January and February has been: How many of these winters are we going to experience? Are we in this for the long haul, or is this somewhat temporary duty, after which we will go someplace where winter is very different? The answer, obviously, is complex and dependent on many factors. In the meantime, March is a transition month, so we will watch closely for the telltale signs of spring and hope for an early conclusion to winter. In a couple of weeks, I will have lived in Iowa for two years. I remember my first couple of weeks here in 2011 — late March/early April — as being quite springlike, although they were marred somewhat by a series of tornado watches in the general vicinity. There’s always something. ADDENDUM: It is March 24, and it’s snowing. It’s been snowing for several hours now. Luckily, we aren’t getting the brunt of this storm, which is slamming places like Kansas City to the south of us. Still, it’s March 24, and it’s snowing. That’s not right.